Ce document au format PDF 1.4 a été généré par PScript5.dll Version 5.2.2 / GPL Ghostscript 8.15, et a été envoyé sur fichier-pdf.fr le 24/04/2015 à 19:28, depuis l'adresse IP 105.99.x.x. La présente page de téléchargement du fichier a été vue 555 fois. 1. For many verbs, the simple past tense does not end in –ed. 2. The simple past form of these verbs is irregular. Example: I saw the moon. You saw the moon. We saw the moon. They saw the moon. He/she/it saw the moon. 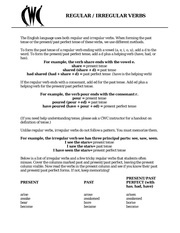 Directions: Write the correct form of the irregular verb in simple past tense. Example: He __________ (to drink) the coffee. 1) The moon __________ (to come) out late last night. 2) Jessica __________ (to lose) her first tooth this morning. 3) My entire family __________ (to catch) the flu last winter. 4) The employees __________ (to do) a lot of work today. 5) The swimmers __________ (to hold) their breath and jumped in the water. 6) The baker __________ (to make) a cake for my birthday. 7) They __________ (to take) a picture of the mountain. 8) The teacher __________ (to teach) the students chemistry last year. 9) I __________ (to wear) my jacket to work yesterday. 10) We __________ (to go) to the zoo last weekend. 10) Tom __________ (to write) his family a letter. 12) I __________ (to see) a movie last night. 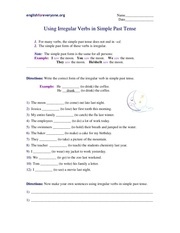 Directions: Now make your own sentences using irregular verbs in simple past tense. Ce fichier a été mis en ligne par un utilisateur du site. Identifiant unique du document: 00322633.